Volatile compounds are molecules with a relatively low molecular weight allowing for an efficient evaporation into the air. They are found in many areas of our everyday-life: they are responsible for the communication between species such as plants, insects or mammals; they serve as flavours or fragrances in many food products or perfumed consumer articles; and they play an important role in atmospheric chemistry. This book takes an interdisciplinary approach to volatile molecules. Review-style introductions to the main topics in volatile chemistry and biology are provided by international experts, building into a broad overview of this fascinating field. Dr. Andreas Herrmann is a research chemist at Firmenich SA, an international flavour and fragrance company, in Genève (Switzerland), working on the development of new fragrance delivery systems. He has published a series of research papers on the chemical release of volatiles under mild reaction conditions. He is the author or co-author of about 30 scientific publications and 10 international patent applications. 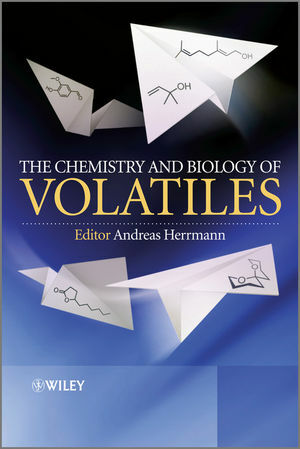 1 Volatiles – An Interdisciplinary Approach (Andreas Herrmann). 1.2 Geraniol – A Typical Example. 2 Biosynthesis and Emission of Isoprene, Methylbutanol and Other Volatile Plant Isoprenoids (Hartmut K. Lichtenthaler). 2.3 Two IPP-Yielding Pathways in Plants. 2.4 Prenyl Chain Formation and Elongation. 2.5 Compartmentation of Plant Isoprenoid Biosynthesis. 2.6 The Enzyme Steps of the Plastidic DOXP/MEP Pathway of IPP Formation. 2.7 Cross-Talk Between the Two IPP Biosynthesis Pathways. 2.9 Inhibition of Isoprene Biosynthesis. 2.10 Inhibition of Carotenoid and Chlorophyll Biosynthesis by Fosmidomycin and 5-Ketoclomazone. 2.11 Biosynthesis and Emission of Methylbutenol at High Irradiance. 2.12 Source of Pyruvate for Isoprene and Methylbutenol Biosynthesis. 2.13 Branching Point of DOXP/MEP Pathway with Other Metabolic Chloroplast Pathways. 2.14 Is There a Physiological Function of Isoprene and MBO Emission? 2.15 Biosynthesis and Emission of Monoterpenes, Sesquiterpenes and Diterpenes. 2.16 Some General Remarks on the Regulation of Terpene Biosynthesis in Plants. 2.17 Volatile Terpenoids as Aroma Compounds of Wine. 2.18 Function of Terpenes in Plant Defence. 3 Analysis of the Plant Volatile Fraction (Patrizia Rubiolo, Barbara Sgorbini, Erica Liberto, Chiara Cordero and Carlo Bicchi). 4 Plant Volatile Signalling: Multitrophic Interactions in the Headspace (Andre Kessler and Kimberly Morrell). 4.2 The Specificity and Complexity of Herbivore-Induced VOC Production. 4.3 Ecological Consequences of VOC Emission. 5 Pheromones in Chemical Communication (Kenji Mori). 5.2 History of Pheromone Research. 5.3 Research Techniques in Pheromone Science. 5.4 Structural Diversity Among Pheromones. 5.5 Complexity of Multicomponent Pheromones. 5.6 Stereochemistry and Pheromone Activity. 5.7 Pheromones With Kairomonal Activities. 5.9 Invention of Pheromone Mimics. 6 Use of Volatiles in Pest Control (J. Richard M. Thacker and Margaret R. Train). 6.2 Repellents (DEET, Neem, Essential Oils). 6.3 Volatile Synthetic Chemicals and Fumigants. 6.6 Plant Volatiles and Behavioural Modification of Beneficial Insects. 7 Challenges in the Synthesis of Natural and Non-Natural Volatiles (Anthony A. Birkbeck). 7.1 Introduction – The Art of Organic Synthesis. 7.2 Overcoming Challenges in the Small-Scale Synthesis of Natural Volatile Compounds. 7.3 Overcoming Challenges in the Large-Scale Synthesis of Nature Identical and Non-Natural Molecules. 7.4 Remaining Challenges in the Large-Scale Synthesis of Natural and Non-Natural Volatiles. 7.5 Design and Synthesis of Novel Odorants and Potential Industrial Routes to a Natural Product. 8 The Biosynthesis of Volatile Sulfur Flavour Compounds (Meriel G. Jones). 8.1 Introduction: Flavours as Secondary Metabolites. 8.2 Sulfur in Plant Biology. 8.3 Sulfur Compounds as Flavour Volatiles. 8.4 The Alk(en)yl Cysteine Sulfoxide Flavour Precursors. 8.5 Biosynthesis of the Flavour Precursors of Allium. 8.6 Formation of Volatiles from CSOs. 8.7 The Allium Flavour Volatiles. 8.9 The Enzyme Lachrymatory Factor Synthase. 8.10 The Biological Roles of the Flavour Precursors. 8.11 The Glucosinolate Flavour Precursors. 8.12 GS and Their Biosynthetic Pathways. 8.13 Release of Volatile GS Hydrolysis Products. 8.14 The Biological Role of Glucosinolates. 8.15 Application of Transgenic Technology to Applied Aspects of GS Biosynthesis. 8.16 Volatile Sulfur Compounds from Other Plants. 9 Thermal Generation of Aroma-Active Volatiles in Food (Christoph Cerny). 9.3 Formation of Aroma Compounds in the Later Stages of the Maillard Reaction. 10 Human Olfactory Perception (Alan Gelperin). 10.2 Historical Perspective on Olfactory Perception. 10.4 Functional Studies in Human Subjects. 10.5 Functional Studies in Brain-Damaged Subjects. 10.6 Single Odorants, Binary Mixtures and Complex Odour Objects. 10.7 Olfactory Versus Trigeminal Odorant Identification. 10.8 Orthonasal Versus Retronasal Odour Perception. 10.10 MHC-Correlated Odour Preferences in Human Subjects. 10.11 Odour Deprivation and Odour Perception. 10.12 Age-Related Decline in Olfactory Perception. 10.13 New Neurons in Adult Brains. 10.14 Epidemiological Studies of Human Olfaction. 10.15 Active Sampling and Olfactory Perception. 10.17 Top-Down Influences on Olfactory Perception. 10.18 Reproductive State and Olfactory Sensitivity. 10.19 Olfaction, Hunger and Satiety. 10.20 Odour Perception Bias by Odour Names. 10.21 Olfaction and Disease States. 10.22 Prenatal and Postnatal Influences on Infant Odour/Flavour Preferences. 11 Perfumery – The Wizardry of Volatile Molecules (Christophe Laudamiel). 11.2 Wizardry No. 1: Full Holograms Create Real Emotions. 11.3 Volatiles Need a Language Wizard. 11.4 Wizardry No. 2: The Perfumer in the Jungle of Volatiles to Create Emotions. 11.5 Wizardry No. 3: End Results Are Music to the Nose. 12 Microencapsulation Techniques for Food Flavour (Youngjae Byun, Young Teck Kim, Kashappa Goud H. Desai and Hyun Jin Park). 12.2 Microencapsulation in the Food Industry. 12.3 Techniques and Materials for Flavour Microencapsulation. 12.4 Conclusion and Future Trends. 13 Profragrances and Properfumes (Andreas Herrmann). 13.3 Release of Carbonyl Derivatives. 13.4 Profragrance and Properfume Strategies. 14.2 The Relative Importance of Anthropogenic Versus Biogenic VOC Emissions to Atmospheric Chemistry. 14.3 Overview of BVOC Oxidation. 14.4 The Types of Emitted BVOCs and General Roles in Atmospheric Chemistry. 14.5 Gas Phase Oxidation of BVOCs. 14.6 Gas Phase Chemistry of BVOCs in Urban and Suburban Airsheds. 14.7 Gas Phase Chemistry Within and Above Forests. 14.8 BVOC Emissions and SOA Formation.